Henry Ford once said that "History is more or less bunk”. But to be fair to the old curmudgeon he also said that “…the only history that is worth a tinker's damn is the history that we make today." Made in Dagenham is certainly about the making of history - although whether Ford’s successors at the automobile giant that bears his name would wish to be reminded about the events of 1968 is another matter. In short the story is about how a group of less than 200 women workers at Ford’s huge Dagenham plant organised industrial action in pursuit of their goal for equality of treatment with the 40,000 men employed there. In particular they wanted an acknowledgment that the work that they did sewing seat covers was at least “semi-skilled” – a category which brought with it higher wages than the “unskilled” category into which Ford’s management had reassigned it. This demand soon escalated into a more general call to stop the discrimination against women which saw them paid significantly less than men doing equivalently categorised work. Nigel Cole’s movie accurately depicts the key events of the Dagenham girls’ (as they were called) protest but focuses and fictionalises the story to give it pace. The main character, Rita O’Grady superbly played by Sally Hawkins, is an amalgam of a number of the women who were prime movers in the action. Social change which comes from the bottom up, as it so often does, needs charismatic and determined characters to drive it - and Rita is certainly that. But the climate also has to be right and in that respect the protest happened at the right time. In 1968 there was a Labour Government with a decent majority in power and the newly appointed Secretary of State for Employment was the feminist firebrand Barbara Castle. 1968 was also a year in which protests and activism reached their post war apogee – the “Prague Spring”, Civil Rights and anti-Vietnam War protests in the United States, student protest and sit-ins in London, Paris, Berlin, and around the world. The extent to which the climate of protest affected the Dagenham strikers is not covered in the film – but its true to say that these were watershed times and conventional wisdoms and orders were being challenged everywhere. The 1960s was the decade when women began to assert their rights in the western world for the first time since the suffrage movement and although on the face of it the revolt of less than a couple of hundred women in Dagenham may seem insignificant in the context of other events of the times in fact it was the spur that was quite rapidly to lead to legislation for equal rights in the United Kingdom (1970) and then around the world. The momentum for change caught the business world unaware and unprepared. One of the most revealing scenes in Made in Dagenham is when Ford sends one of their senior managers over from Detroit to quell the rebellion. His language and demeanor pours fuel on the flames and strengthens the resolve not only of the protestors but also of Barbara Castle whom he threatens that Ford might withdraw from production in the UK entirely. Despite Prime Minster Harold Wilson’s (an amusing cameo by John Sessions) wishes not to upset Ford - “I’ve enough problems with America at the moment” – Castle supports the Dagenham women and helps negotiate a settlement which is entirely in their favour. 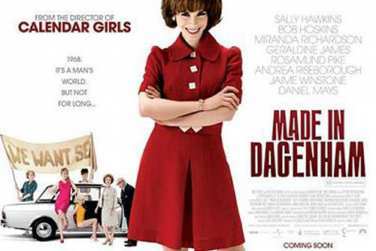 Made in Dagenham gets right not just the employment iniquities of the 1960s – including a brilliant demolition of the disingenuous and complacent union convener at the factory – but also the social mores of the times. Women are expected by their menfolk to know their place – not just the working class working women of Ford but also the wife of the Plant Director Lisa Hopkins (nicely played by Rosamund Pike) who despite her Cambridge degree and intellect is expected to be just a pretty appendage to her husband. She teams up with Rita to lend her both support and a smart red Biba dress for her meeting with Barbara Castle. The only man who comes out of the story with any integrity intact is Albert, a Supervisor at the plant beautifully played by Bob Hoskins in his best role for years. The rest of the male characters are utterly bewildered by the idea of change – including Castle’s two senior civil servants who are classic “Yes Minister” officials and who Castle brushes contemptuously out of her way. Made in Dagenham is history – and the historical context is 100% authentic from the cars to the shops to the costumes – and above all the attitudes. But it would be dangerous and wrong to assume that the victory that the Dagenham women won was the end of the struggle – either for women or for others who are discriminated against. The power of orthodoxy is arguably as strong today as it was in 1968 – conservative attitudes prevail and in some respects have been strengthened by recent events. There is an unwillingness, at times, to challenge the employment practices of business - from bankers’ bonuses to underfunded pension schemes and to the apparent preparedness of those in power to accept that it doesn’t matter if British businesses (even football clubs!) are taken over by absentee foreign owners. In 1968 it was “cometh the hour cometh the woman” – in 2010 perhaps we need more of the same. Tamara shocks them - far from the madding crowd. A brilliant and repulsive "Salome"